Now is a great time of year. Not only is it still the beginning of summer with all the hope and promise of good things to come, stretching out in front of us like an endless sky, but some of my favourite plants are flowering too. Irises, roses and peonies epitomise everything that is beautiful about summer. Last year, I wrote about some our favourite tall bearded irises here at Sissinghurst with the past and present Head Gardeners choosing their favourite cultivars. 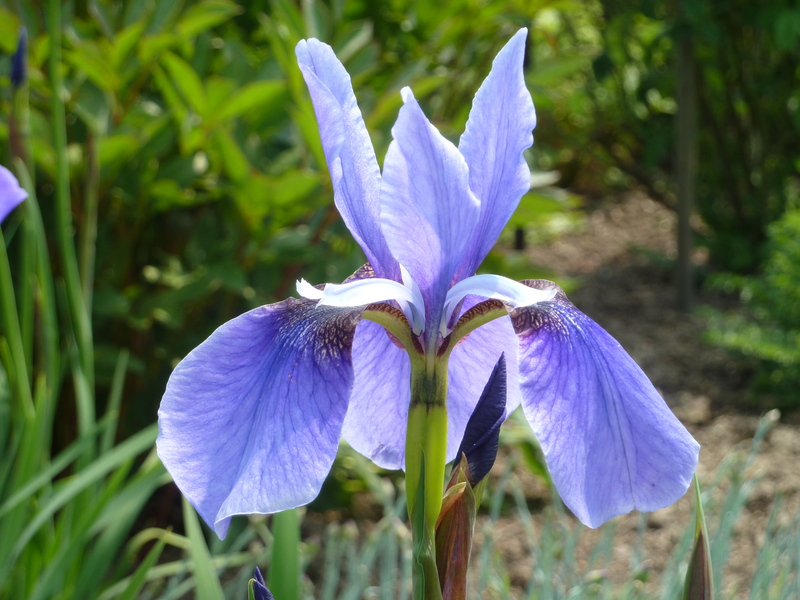 This year, it’s the turn of Iris sibirica to have some glory and adoration. They have certainly had a moment of fame this year, with Chelsea being absolutely full of them but that’s not really so surprising; they are beautiful plants. At Sissinghurst we have many lovely sibirica cultivars mostly in shades of blue, purple or white, but for me it is their shape and form that makes them truly garden worthy plants They have a natural elegance and grace forming strong vertical lines which associate well with other garden plants. Their flowers remind me of butterflies dancing in the sun, hovering on top of slender stems. 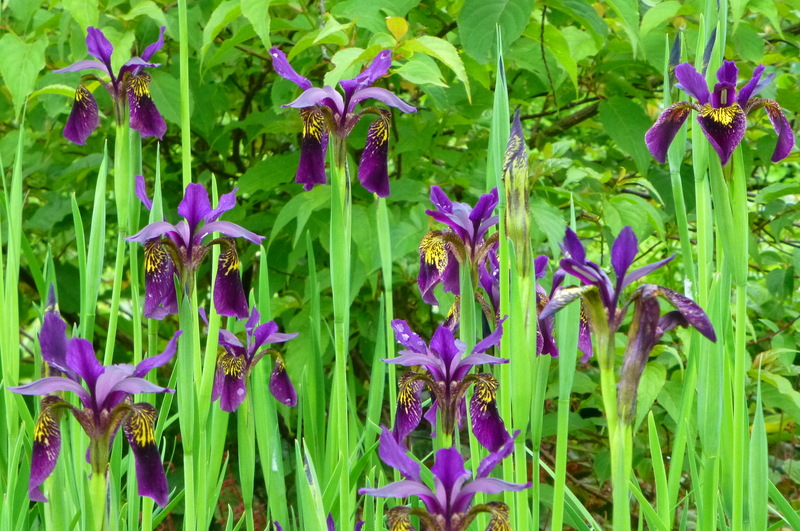 Although smaller in size than the tall bearded irises, they still create a strong presence in the borders especially when grown in a significant group, their flowers lighting up the border like fairy lights. The leaves are upright in habit and fresh green showing off the flowers to perfection. It’s not surprising that Vita Sackville-West had great admiration for these plants and wrote about them extensively in her Observer articles describing them as ‘exceedingly graceful and pretty and most accommodating’. There are two distinct groups of Iris sibirica; those with 28 chromosomes that originate from Northern Italy, Turkey and Southeastern Russia and those with 40 chromosomes which originate from the Himalayas and China. The first group also contains Iris sanguinea and Iris typhifolia whilst the second group contains nine species including Iris chrysographes. This latter group are now called Sino-Siberians. Generally the 28 chromosome hybrids are easier to grow than the Sino-Siberians. They prefer full sun but they’ll be happy in a little dappled shade too. Soil should be moist but not too wet and they definitely won’t tolerate waterlogged conditions so don’t plant them in a pond. As Vita wrote in her usual forthright manner ‘…it will do well by the waterside in a fairly damp bed, although it does not like being drowned underwater all year round.’ However, once the plant is established it will tolerate a dry spell as long as it is not prolonged. As for soil type, they are unfussy but a neutral soil would be perfect for them. At Sissinghurst we have groups growing and thriving all over the garden. I. ‘Kenogami’ is growing in both the Rose Garden and the Purple Border and we also grow ‘Butter and Sugar, ‘Southcombe White’, ‘Mysterious Monique’ and ‘Flight of Butterflies’ in the Rose Garden. In recent years ‘Flight of Butterflies’ has not flowered well, possibly because it is has become shaded by larger shrubs. Last autumn, we split it and replanted it in the same place whilst thinning or removing some of the larger shrubs which may help it to flower better next year. Interestingly, three of the sibiricas we grow here were mentioned in ‘Gardens Illustrated’ this month by the owners of the nursery, Hortus Loci. 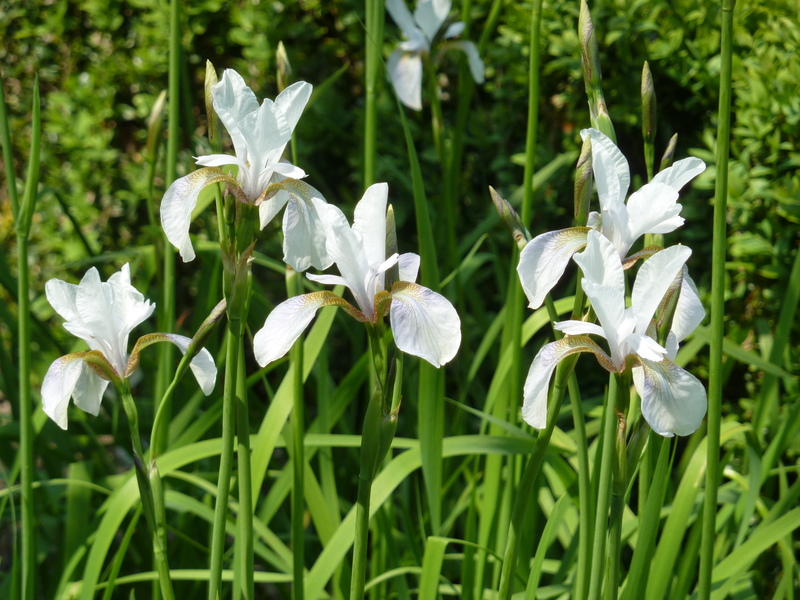 In their choice of 24 stunning plants for early summer they chose Iris ‘White Swirl’ which we grow here in the White Garden, Iris ‘Tycoon’ and ‘Flight of Butterflies’ which was described as ‘compact but with perfect poise’. My own favourite is ‘Placid Waters’ which has a name that sums up its character perfectly. The lavender blue flowers have a luminous quality to them and their shape is simple yet graceful. It makes me feel calm just looking at it. Sino-Siberians are trickier to keep happy as they prefer a slightly acidic soil and lots of moisture. Neither do they like to be too hot or too cold. Nevertheless we do have some groups that thrive here, in particular, Iris chrysographes ‘Black Form’, I. chrysographes ‘Rubella’ and an unknown hybrid that is in the Sunk Garden, are very beautiful. The large clump of I. chrysographes just inside the Cottage Garden is looking particularly fine at the moment. Some visitors ask us when the best time to visit the garden is. My answer to that question is always ‘now’ because there’s always something interesting to see, but if you love irises, peonies or roses then the answer is most definitely- ‘Right now’. If you or your friends would like to spend a day gardening with the team here, learning about the Sissinghurst gardening methods, then book yourself a place on our study day on Wednesday 18th June. We’d love to meet you. Booking details can be found on the Sissinghust website. This entry was tagged irises, Sissinghurst, summer. Bookmark the permalink. Helen, this is a wonderful post, not only beautiful photographs, but I really feel as if I have learnt something, thank you for sharing this. I know exactly what you mean too, with ‘Placid Waters’ and I really like the ‘Southcombe White’ Iris – gorgeous. I only grow the species Iris sibirica, I actually had not appreciated there were so many beautiful cultivars, my recommendation would be to read your blog! Like Julie, I had not realised that there were so many cultivars. Your descriptions are lovely, really bringing the plants to life. Thanks for the comment on my blog about West Green House – where of course there are some fine trails of iris sibirica (the species, I think? ).